Did I use fusilli instead of the linguini called for in this recipe from Around My French Table by Dorie Greenspan because I wanted to title my post French Fusilli Friday?? Maybe but more likely because I love a thicker corkscrew type of pasta to soak up the rich flavorful sauce I made using Dorie’s recipe for Beggar’s Linguine or Linguine Mendiante for French Fridays with Dorie. The word mendiant means beggar in French but is normally associated with a rich chocolate candy covered with dried fruits and nuts found in chocolate shops all over France. Chocolate, another good reason to get on a plane going to France. We loved this brown butter sauced pasta made with fusilli cooked al dente with all the dried fruits and nuts. I used dried cranberries instead of the golden raisins because I was thinking that if I made mendiants I would use dried cranberries for the color. Cranberries aside, the dried figs with the orange zest made this dish. I used 14 ounces of fusilli with the amount of butter Dorie calls for in the recipe but I added extra of each one of the dried fruits and nuts. I also used chopped cilantro for the herb that I sprinkled on top and I think mint would be good too. I would love to give the recipe but one of the rules of this online cooking group is not to give the recipe but to refer you to the source of all French Friday recipes, Dorie’s cookbook Around My French Table. The dried fruits and nuts are cut in small pieces for the beurre noisette. The top of the pasta is dusted with fresh grated orange zest, Parmesan Cheese and chopped herbs. This is the second recipe I’ve made from French Fridays with Dorie and so far she’s batting a hundred, a small reference to my beloved San Francisco Giants. Another good reason to get on a plane- Spring training in Scottsdale Arizona. How about a long weekend in Scottsdale and off to France for a few weeks visit? I love your French Fusilli Friday! Your photos look so great! Such pretty pictures! So glad you & your family enjoyed this one! The fusilli is so pretty in this dish! I bet the currants were yummy! Wow, Patty! That looks wonderful & so perfectly plated. I also love your blog banner – very classy! I'm jealous of your gorgeous photos! I loved this one. Either way, the dish looks delicious! Beautiful photos…and I love that you used fusilli! Thanks for visiting over at my blog! So nice to know you aren't talking to the air, isn't it? I love your geometric place mat (underneath the beautiful pasta)! The French Friday is really cool. I'm getting know more about French food! I also glad you used cranberries instead of raisins. I will sometimes that raisins are too sweet. Your fusilli looks fantastic and your tableware is gorgeous! Your new layout/design looks amazing!! I love it – and your photos look fab too. I am with you on the brown butter, love that! And fusilli Friday, lol! I love the curly look of the fusilli instead of linguine. And your table setting is so pretty! Nice photos. Fusilli Friday! Sounds like the beginning of something. Great idea for the change of pasta. I love your pictures. It's great seeing all the different interpretations that members have done. Great post. Your photos and presentation are wonderful! Great idea to use fusilli, it looks wonderful with this dish. I've never had a pasta dish quite like this but I think I'd better change this soon. What a beautiful combination of flavors, such a lovely presentation, too. I really need to open my French Fridays book-so many good recipes! Patty, this is one of the most unique pastas I've seen. So many great flavors combined in one dish for an explosive taste – love it! I'm allergic to nuts, but if I weren't I'd definitely add them for a contrast in texture. Glad you used cranberries instead of golden raisins as I find raisins a bit too sweet for my liking. Plus, the color of the cranberries stand out much better. This dish actually reminds me of a cereal I ear, except in pasta form. This looks healthy, delicious, and packed with flavor Patty. Have a great weekend! Interesting Patty! I was trying to think of when I'd had pasta with fruit (dried) and could recall two times: roasted butternut squash and Israeli couscous with golden raisins and pine nuts and beet greens with raisins and pine nuts. The hit of sweetness and crunch is just right but at first the combo seems a bit strange doesn't it? I think hazelnuts would go well with this too. WEll done, girl! 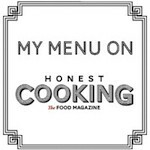 What is this online cooking group you are in? 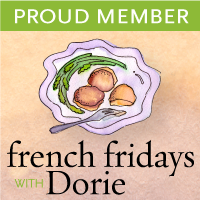 Hi Patty-I found you through “French Fridays with Dorie” …not that I'm a part of it, although I love all the challenging dishes and desserts. Your fusili is spectacular, love the presentation of the pasta with all the healthy, yummy nuts, and dried fruits, and the buttery goodness. Love your fusilli! They look fantastic! They really make the dish look great! I love the fusilli. It looks so much better than linguine. Beautiful pictures. Loving this fusilli with dried fruits and nuts, so yummy! What a great looking pasta! Nice clicks too. Patty…your photos are getting more stunning by each post…your batting a hundred yourself my dear. The pasta dish sounds wonderful…other than the dried fruit, I'd be all over this dish. First thing I have to say is “WOW!!! !” Your new look is drop dead GORGEOUS! Love the fusili shape and look of your pasta dish, and of course, your photos are stunning! Patty what a beautiful pasta dish…love the orange zest…absolutely gorgeous Have a wonderful week! Your going to have to visit France soon before the situation becomes dire , hehe. The pasta looks good and it's such an interesting recipe, I would definitely try it. You are batting a 400 with this French Friday dish! Love the dusting of orange zest with the color contrast of the dried fruit. Stunning photos!